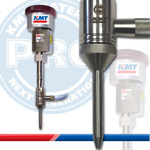 For cutting stainless steel, cutting metal, cutting copper, cutting titanium and similar hard materials that cannot be machined with water only, KMT Waterjet abrasive waterjet cutting nozzles provide the most advanced alignment technology for precision cutting with minimal kerf while holding tolerances up to +/-.003"/.076 mm. Finally! A cutting head with the fewest possible parts making performance simple and reliable. Now, the only pieces which need to be replaced are the focusing tubes and head body. Each IDE® Water Jet Nozzle has a permanently mounted diamond and mixing chamber and each includes the removable abrasive inlet, focusing tube retaining nut, retaining ring and high pressure filter element. IDE® PRO - The Next Generation in Ultra High Pressure Diamond Abrasive Cutting! cutting performance at 100,000 PSI/6,895 bar, consistently demonstrates superior performance and reduced operating cost. 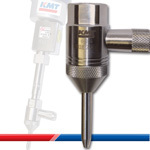 KMT’s expertise in diamond orifice manufacturing brings you a superior one piece cutting head that has revolutionized the waterjet cutting industry.